In West and Central Africa, the elephant is a potent image of political force and the accumulation of wealth by those in power. 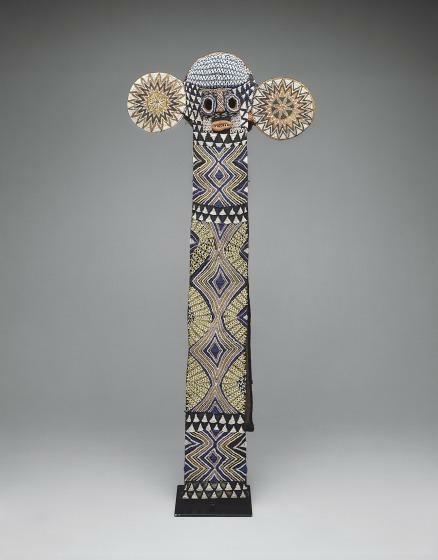 This is true for the art of the Cameroon Grasslands, the origin of this mask, which is elaborately decorated with imported glass beads and represents an elephant. Long panels with geometric forms hanging down the front and back represent the animal’s trunk, and the flat discs with starburst patterns are its ears. The mask can be worn with a headdress made of red tail feathers from the African gray parrot, a precious material usually reserved for the king. 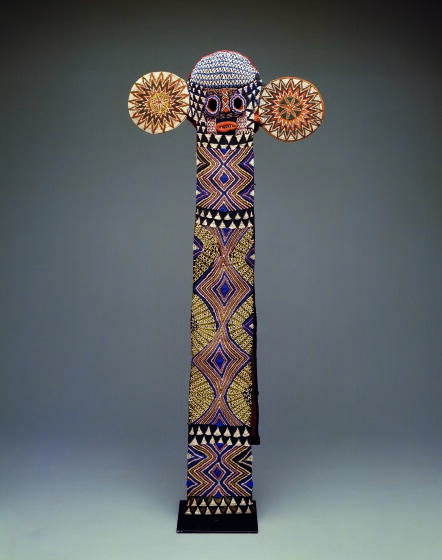 The Kuosi, members of a society that served as the king’s representatives, and at times the king, wore this mask and headdress as they performed the prestigious elephant dance during rituals, festivals, and funerals. Those wearing the costume were concealed under cloth garments trimmed with colobus monkey fur. Ramona Austin, "Elephant masks and hat," in Dallas Museum of Art: A Guide to the Collection, ed. Suzanne Kotz (Dallas, TX: Dallas Museum of Art, 1997), 152. Learn more about this mask and hat.